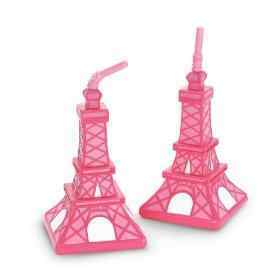 These Eiffel Tower centerpieces, decorations, tableware and more are a simple way to give your next party a little French touch. Everyone recognizes La tour Eiffel as symbolizing France, and these days you can find just about anything stamped with its ever enchanting presence. These foot high replicas of the tower are just a little twisted to give them a note of whimsy. Made from black and silver wire, they can serve as a table decoration, but also as a jewelry stand, or just an interesting object to Frenchify your decor. 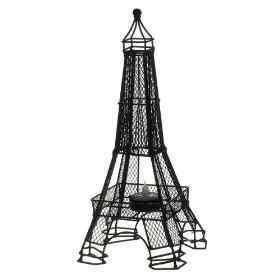 There is enough room to hold a tea candle on the "lower deck" and these Eiffel Tower centerpieces come in a set of two. I just love Jill Butler's charming little drawings. 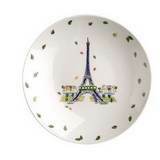 Here the Eiffel Tower is featured as part of her Paris Souvenir Collection. These are sold in cases of six and are just the right size for an appetizer or cheese tasting party. The plate measures seven and a half inches across and is made from quality porcelain. These measure one and one half inch wide by three inches tall. The description says that they are silver, but the price is so low I really have to wonder if that is true. You can order them separately so you get just the number you want without have to spend for extras. You could use these to label cheeses as well for a cheese tasting party. This one is a good size - 20 inches tall - so it is sure to get noticed on your table. Just like the whimsical tower above, this one holds a candle and can also serve as a jewelry stand. These come one per order and are made from metal, just like the real thing! This is a very high quality cookie cutter made from copper and built to last. Use it with your favorite sugar cookie recipe and decorate to your heart's content. It measures seven inches high and four and half inches at the base. By the way, I am ordering one and I'll let you know how the cookies come out! 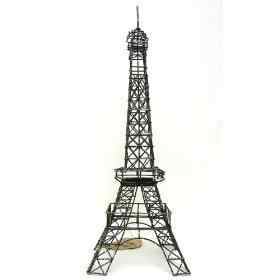 These Eiffel Tower centerpieces are just made from paper and you have to assemble them yourself. Probably good for just one use, but perfect for a little girl's birthday party and not expensive at all. 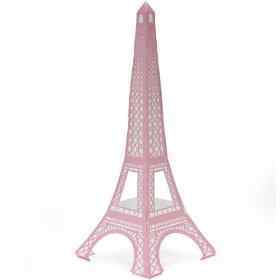 The pink tower is part of the Pink Poodle party collection, which includes a whole bunch of decorations which you can use to create a Parisian puppy party for youngsters, including an Eiffel Tower cake topper. You can use this to hold napkins or letters or whatever else you might wish. It is marketed by a company called Abbott that has a truly delightful collection of housewares and gifts, many with a French influence. Abbott does not sell directly to the public but you can find many of their things on Amazon. Okay, I know this is silly, but I just could not resist. If my kids were still little, I know they would eat a whole lot more whole wheat toast if I just had this. Made from plastic and dishwasher safe, press this into a piece of bread before you toast it. When it comes out of the toaster it will have a picture of the tower with "Bonjour" written over it. This is made by Fred and Friends. Seven ounce plastic cups with straws and removable tops to cut back on spills. Another item perfect for a little girl's birthday party. And don't forget the real thing . . .
We've been living right next to Paris for some time now, so I've seen the Eiffel Tower my fair share of times. But somehow it always has an aura of magic no matter how many times you have seen it. 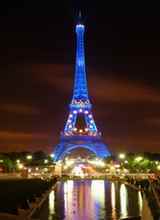 I recall one time in particular, a bit lost in Paris at night time, I came around a corner and there, most unexpectedly, was La Tour lit up from head to toe in sparkling blue lights. It was literally breathtaking. 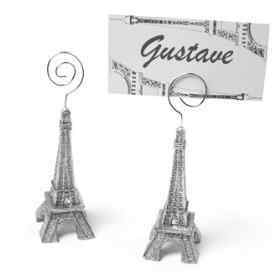 Return from Eiffel Tower centerpieces to French decor.